The follicles of the bursa of Fabricius consist of a three dimensional meshwork of reticulo-epithelial cells of which the intercellular spaces are filled with (B) lymphocytes, lymphoblasts and macrophages. The cortex contains mesenchymal reticular cells, macrophages and more closely packed, small B lymphocytes, what causes the darker color. 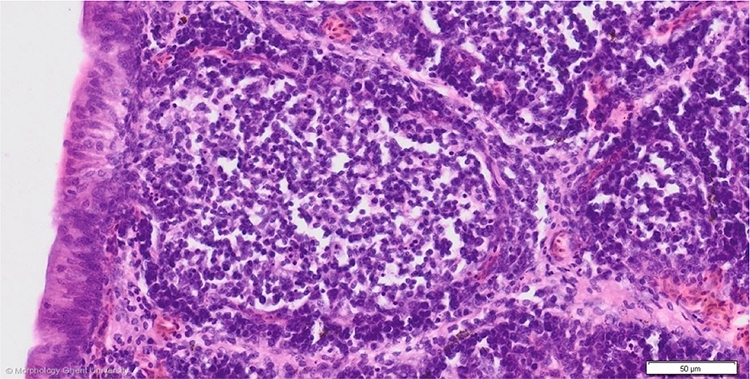 The medulla contains a more heterogeneous cell population but the total number of cells is lower , hence the paler color. The medulla contains mostly lymphoblasts, medium to small B lymphocytes, macrophages, secretory dendritic cells and reticular epithelial cells.